Which countries have emitted the most greenhouse gases? The quick answer is, "It depends." A more definitive response is tougher than you may expect. Many factors inform the answer. What time frame are you considering? Do you want to count cumulative emissions of a country over a long period of time, or only look at current annual emissions? And do you include emissions and removals from things like land use change and forestry? Or perhaps you want to know whether and when a country's emissions have peaked? The five visuals below help answer this question, taking into account each of these different factors. All of the visuals were created using data from the powerful Climate Watch platform. Chart 1: ranking of countries by greenhouse gas emissions over time, 1850-2014. Visualization developed by Mahfooj Khan in collaboration with Viz for Social Good. Note: The rankings from 1850-2014 in this chart are based on GHG emissions excluding land use, land use change, and forestry (LULUCF) from PIK-PRIMAP dataset, accessed through Climate Watch. LULUCF emissions are excluded as estimates for this sector have high levels of uncertainty in the early years. If those emissions were included, the GHG emissions of countries like Indonesia, Zimbabwe, and Brazil would be larger. The European Union is included in the ranking in addition to the 28 EU member countries. The world now pumps 40 times more greenhouse gas (GHG) emissions into the atmosphere than we did back in 1850. While emissions have increased dramatically over this time, those responsible for the largest shares of emissions haven't changed as much as one might expect. Seven countries have consistently been among the top emitters on an annual basis and have driven emissions growth since 1850—namely the United States, the United Kingdom, Germany, France and Russia, and more recently India and China. In comparison, if you rank countries from largest emitters to smallest, three-quarters of the 50 lowest emitting countries in 2014 are the same countries as in 1850. 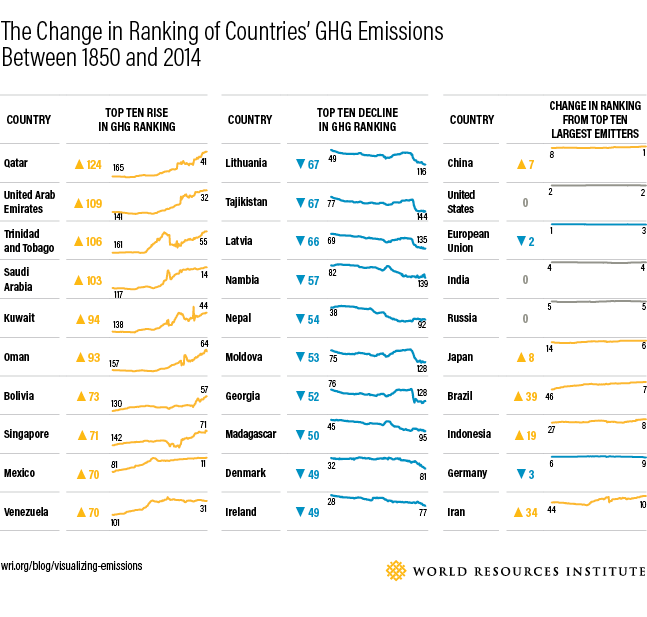 Chart 2: Biggest changes in the ranking of countries’ GHG emissions between 1850 and 2014. Table 1: Change in rankings of countries’ GHG emissions between 1850 and 2014. Filter by different metrics, including largest and smallest change in rank and by today’s largest emitters. Note: The rankings in Chart 2 and Table 1 are based on GHG emissions excluding land use, land use change, and forestry (LULUCF) from PIK-PRIMAP dataset, accessed through Climate Watch. LULUCF emissions are excluded since emission estimates for this sector have high levels of uncertainty in the early years. The European Union is included in the ranking in addition to the 28 EU member countries. If EU is excluded, the top 10 largest emitters will also include Mexico, which is among the ‘top 10 rise in GHG ranking’. A few countries stand out for the significant changes in rank they have experienced. Most of the biggest jumps are observed in oil and gas producing countries—almost all the countries with the largest increase in rank have petroleum products as a main export. At the same time, the breakup of the Soviet Union contributed to major declines in Lithuania, Tajikistan, Latvia, Moldova and Georgia. 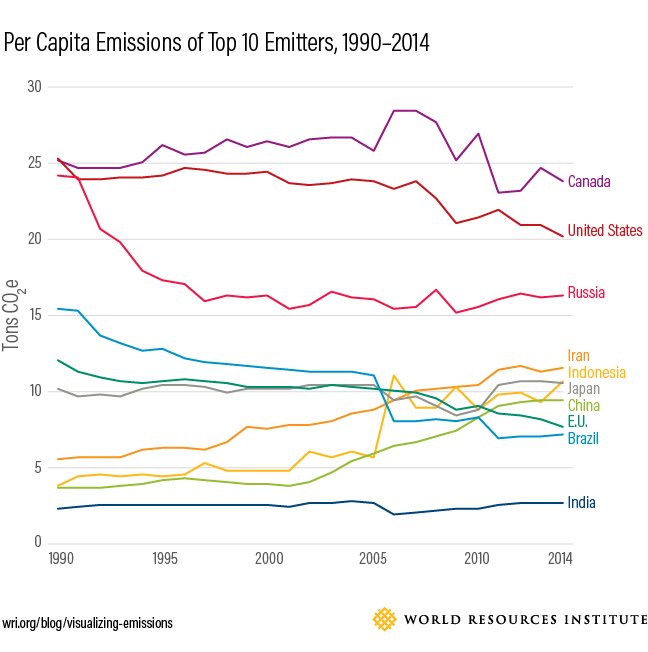 Perhaps the most important takeaway from Chart 2 is how consistent the top ten emitters have been over the years. Six countries or blocs that were top emitters in 1850 remain so over 160 years later – the European Union, China, Germany, India, Russia and the United States. Chart 3: Change in rank over 1990-2014 of the top 20 emitting countries in 2014. Visualization developed by Neil Richards in collaboration with Viz for Social Good. Note: The emissions data from 1990-2014 in this chart are based on GHG emissions including land use, land use change, and forestry (LULUCF) from PIK-PRIMAP dataset, accessed through Climate Watch. Despite growing international concern over climate change, global emissions have continued to rise steadily. The world's total emissions have increased by 31 percent (including emissions from LULUCF) between 1990 and 2014. Growth has been driven by major economies such as China, which surpassed the U.S. as the world's largest emitter in 2005, although the U.S. remains the largest emitter in cumulative terms. While many of the largest emitters in 1990 had fallen back a bit by 2014, Iran, Saudi Arabia, South Korea, Pakistan, and Nigeria jumped ahead by at least 10 places over those 25 years, landing them among the top 20 largest annual emitters in 2014. Chart 4: Per capita GHG emissions of top 10 emitters, 1990-2014 Note: The top 10 emitters, as well as the emissions data from 1990-2014 used in this chart are based on GHG emissions including land use, land use change, and forestry (LULUCF) from PIK-PRIMAP dataset, accessed through Climate Watch. Population data is based on World Bank World Development Indicators. If European Union is not counted, the group will include Germany instead, whose per capita emissions in 2014 is around 10 tCO2e. Developing countries have seen significant emissions growth in recent years, but in per capita terms the picture is much different. For instance, while India's overall emissions are climbing upward, their per capita emissions have stayed well below the other top emitters; the United States' per capita emissions are currently more than seven times that of India. However, per capita emissions of other emerging economies like Indonesia, China, and Iran are creeping upward and have exceeded those of some developed countries, as well as the average per capita emissions of the European Union. WRI analysis finds that 49 countries were able to peak their emissions by 2010 and four more are expected to peak by 2020. According to countries' climate commitments under the Paris Agreement, seven of the current top 10 emitters (China, the United States, Russia, Japan, Brazil, Germany and Mexico) have peaked or have commitments to peak their emissions by 2030. Chart 5: Greenhouse gas emission peak dates and country-level emissions. Visualization developed by Carbon Brief and peak dates based on the WRI Turning Points report. Note: Country emissions from 1990-2015 based on date from PIK and UNFCCC. Some major emitting countries like the U.K., France, Brazil, Spain and Canada have been able to sustain their economic growth and at the same time peak or even decrease their level of emissions. The fact that a quarter of all countries' emissions have peaked their emissions is encouraging. Peaking is just the first step towards making deep, rapid emission reductions necessary to achieve an emissions trajectory consistent with long term low carbon future. Countries must make and achieve commitments to peak their emissions as soon as possible, set their peaks at lower emissions levels, and commit to a significant rate of emissions decline after peaking. This is just a taste of the climate data you can explore and draw insights from on Climate Watch. We encourage you to visit the platform yourself and see what you discover.